Introduction: 15th August is a historical Day for India. It is our Independence Day. This day after a long journey and hard struggle, India won freedom from the clutches of the Britishers. It was a unique war of non violence which was led by great leaders, like Mahatma Gandhi, Pandit Jawaharlal Nehru, Subhash Chandra Bose, Gopal Krishna Gokhale, Lala lajpatrai, lokmanyatilak, Sardar Vallabhbhai Patel, Bhagat Singh, and Chandrashekhar Azad. It was a mass movement in which common people took an active part. It was a result of sacrifices of selfless leaders and people, who dedicated their lives for future generations. 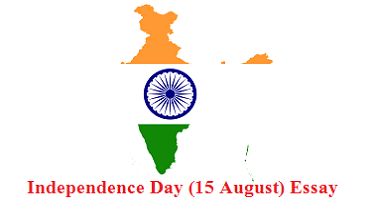 First independence: On 15th August 1947, the nation celebrated its first independence day. It was a day of rejoicing and tried. Our first Prime Minister Pt. Jawaharlal Nehru hoisted the national flag from the ramparts of the Red Fort in Delhi. This was the dawn of a new era. It was a promise of progress and prosperity. Flights of Tricolor flag: The Independence Day since then is celebrated every year all over the country. On this day, the sky is filled with the tricolor flag. Like thousands of rainbows, the flags flew in the sky over lofty buildings. Almost every institution, School, office and college celebrates the flag ceremony. Celebrations in schools: The schools organize special assemblies in which homage is paid to those who laid their lives for the independence of the country. Patriotic songs and Re-enactment of the famous episodes of independence struggle are performed. These motivate the children to serve the nation and be ready to sacrifice. Painting, dancing, music and drama competitions are organised to commemorate the occasion. The newspapers publish special supplements on the Independence Day. Conclusion: The Independence Day reminds us of the dedication, suffering and struggle of our freedom fighters and leaders who gave India the freedom. It is our duty to protect the freedom of the country for this we should remain United and work for the progress of the country this day should not be just a ritual, but we should think of the poor who are still not free from poverty, hunger and slavery. Freedom should bring cheers to every Indian, whether poor or rich.